You’ve probably heard about the benefits of filtering your drinking water. Filters allow you to remove unwanted and potentially harmful contaminants from your drinking water supply. But they may also remove healthy minerals that you do want in your water! An alkaline water filter may provide a good solution to this issue. In this guide, we’ll help you find the best alkaline water filter for your needs & budget. Alkaline filters can do several things: improve the quality and taste of your water, remove contaminants, balance pH levels, and improve the antioxidant potential of drinking water. 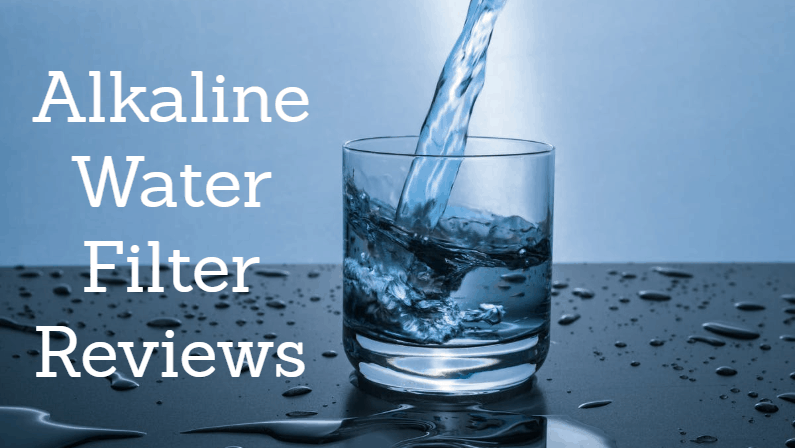 There are several different types and styles, so we’ve put together a list of our recommendations for the best alkaline water filters available today. The iSpring RCC7AK is an effective alkaline water filter. It uses reverse osmosis (RO) technology, which is considered to be one of the most effective water filtration methods. While quite effective, RO systems tend to remove healthy minerals and can disrupt the pH balance. So, this unit also includes an alkaline remineralization filter that further purifies while adding back in healthy minerals. This 6-stage filter is rated to remove up to 99% of over 1,000 different contaminants, including heavy metals, chlorine, arsenic, fluoride and more. The unit installs snugly under your kitchen sink, and actually comes with a sink faucet you can use (or you can use your existing faucet). The entire unit is easy to install, and fits under a standard kitchen sink. If you need help during setup, iSpring representatives are just a call away. We reviewed this unit in more detail here. Note: the review looked at the base unit of this product, without the alkaline remineralization attachment. 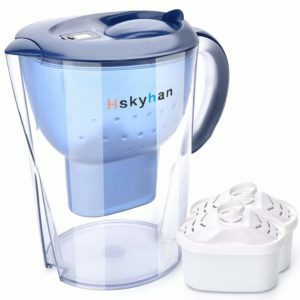 The Hskyhan Alkaline Water Pitcher is a great budget-friendly alkaline water filter. It’s a standard pitcher filter design, so you just fill it up with water and put it in the fridge. Thus, there’s no installation to worry about, and it’s very affordable at less than 1/4 the price of other options. The filters have 7 unique stages including activated carbon, resin, coconut shell, filter mesh and more. They are designed to last about 4 weeks with regular use, and replacement filters are affordable. The smart lid actually tracks the filter lifespan and reminds you when it’s time to replace. The Hskyhan filter comes with a 18 month warranty, and a 30-day satisfaction guarantee. If you don’t like the product, return it within 30 days for a full refund. 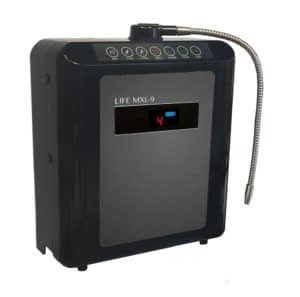 The Life Ionizer MXL-9 is one of the best alkaline water filters on the market. It’s a different style than others on this list because it’s a standalone machine. It not only filters your water, but offers the ability to customize the pH range of your filtered drinking water. This is certainly a luxury product considering the pricetag, but it’s a wonderful option for folks who don’t mind spending a bit more. With the Life Ionizer, you can filter out contaminants with the included pre-filter. Then you can customize the pH level from anywhere from 2.0 to 11.5, providing a wide range of options. The entire unit is self-cleaning and self-regulating, and is very easy to use. The Life Ionizer has received excellent reviews from customers and experts alike. It also comes with an impressive lifetime warranty. For more options like this one, see our Best Water Ionizer guide. Wondering how to make water alkaline? There are a couple different options. First things first, you’ll likely want to test your current water to see what its pH level is. There are a couple of different ways to do this. Alkaline water filter/water machines – There are specialized tools you can used to make alkaline water at home. We listed our favorites in the guide above. This is by far the easiest and most effective way to make alkaline drinking water. Water additives – You can also add different things to your drinking water to change the pH levels manually. You could use baking soda (very alkaline), lemon juice, or pH drops. Of course, any additives will change the flavor of your water, so keep that in mind. Cleaner Water – First and foremost, the filters on this list are effective in removing contaminants like chlorine, heavy metals and more. This results in cleaner, healthier water for your family. Balanced pH Level – Alkaline water filters can improve the pH level of your drinking water. Standard tap water is usually at a pH of around 6-7, while alkaline water is usually around 8 or 9. This can provide some potential health benefits, including improved hydration and potentially digestive benefits, as well. There’s limited evidence that alkaline water may also improve symptoms of acid reflux. Keep in mind that more research is necessary to definitively prove these claims. Antioxidant Potential – There is limited evidence to suggest that drinking alkaline water may have antioxidant effects. One 2006 study found that alkaline drinking water helped to protect against oxidative damage to DNA and protein. Another study found similar results – but to be fair, other studies have found no effect. 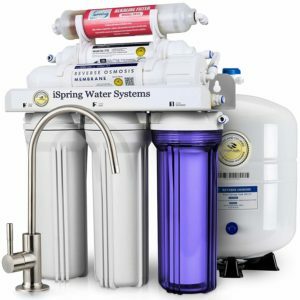 Healthy Minerals – Many of the most effective water filtration methods, such as reverse osmosis, do a good job of removing unhealthy contaminants. Unfortunately, they also remove healthy minerals that your body needs. The World Health Organization has warned about the potential risks of drinking de-mineralized water long-term. Thankfully, alkaline water filters can help to restore healthy mineral content in your filtered water. Filtration Technology – There are several different types of filters that can be effective, but each have their own pros and cons. We focused on products that use effective, proven filtration technology to remove contaminants. Remineralization Tech – When it comes to alkaline water filters, most use multiple stages. They basically filter out all the contaminants, which also removes minerals. Then they add back in healthy minerals, improving the taste and pH level of the finished water. We chose products that use clever and effective remineralization technology. Durability & Warranty – We focused on high quality and durable products. And because we understand that even high quality products can break, we also looked for filters that come with a warranty and good customer support.